Redesign an assembly line to increase productivity and achieve work rates of 60 pieces per minute. Automate work previously done manually, ensure precise handling, positioning and even folding; improve quality control and employ measures to prevent jamming. Employ a FANUC M-1iA delta robot equipped with iRVision to visually inspect and pick up items arriving randomly on a conveyor before placing them onto a transfer belt. Use an LR Mate 200iD to retrieve these and insert them into packaging. A compact streamlined production line that realises excellent cycle times and dispenses with the need for additional conveyors and equipment. Flexlink has combined a delta robot and an anthropomorphic robot (made by FANUC) to implement an innovative automatic loading system for blisters in the pharmaceutical field. The handling of materials from one machine to another on a production line is one of the key competences of Flexlink, which since its famous conveyors is able to now offer several robotic and entirely customized solutions to optimize the flow of materials and information within the production processes: from small installations to complete establishments. Today, it is part of the Coesia group, and the company has a long tradition and a lot of expertise in the creation of robotic solutions for many different application areas; from cosmetics to pharmaceuticals, from consumer products to electronic cards. The words of Andrea Sambuy,CEO of Flexlink in Italy and in the emerging countries: "The Coesia group offers a complete series of automated packaging machines and industrial processing solutions. Flexlink belongs to the IPS (Industrial Process Solutions) division, which substantially handles the management of product flow between two machines on a production line." Flexibility and compactness for medical applications. An example of innovative use of robotic solutions combined to a conveyor is what Flexlink has achieved for an important medical device producer who needed to increase productivity. Flexlink's intervention aimed to connect the assembly line in a more effective manner, ensuring a higher productivity compared to the previous activities that were only handled by hand and, simultaneously, by implementing greater quality control to avoid jamming caused by the presence of products that were not deposited in the correct manner. The piece to be handled, depending on the production lot is closed by a lid of a different color that identifies its length and size. The peculiarity of this piece, from a manipulation viewpoint, is that it requires a very unique positioning; it cannot simply be moved and deposited, some elements must be appropriately folded and, subsequently, delicately pushed and inserted in its packaging. Furthermore, another inherent difficulty faced in the course of this project was to reach the work speed requested, equal to 60 pieces a minute. A robot for every one. Flexlink chose to use a solution with particularly advanced robots using two different types: a delta robot model FANUC M-1iA and an anthropomorphic FANUC robot model LR Mate 200iD, both supported by an iRvision visual system. The first robot picks up the pieces in motion and present in bulk on the conveyor belt load. The robot is equipped with a visual system that guides the automatic retrieval of the piece that arrives in a disorderly position and orientation on the belt. The same visual system also carries out a quality check of every single piece coming. In case of anomalies, the piece would be left on the conveyor, which would discard it at the end. Once retrieved, the FANUC M-1iA robot deposits it on an intermediate conveyor activated by stepper motors to orient it in the appropriate manner in the retrieval area. At this point, the anthropomorphic FANUC LR Mate 200iD robot, equipped with a double grasping clamp, intervenes by inserting the two parts to delicately move the piece and insert it in its packaging. The visual system, when combined to the second robot, carries out another check to prevent any incorrect position. "The choice of a compact delta robot for the first retrieval was taken based on the need to better exploit the available space and to achieve excellent performance levels in terms of speed and precision", explains Davide Zuffa, Engineering Manager of Flexlink. The FANUC M-1iA robot was created to face this type of projects for which there is a need to move and assemble small objects at high speeds and accurately. It's a very compact model with a work diameter of 280 mm and that carries loads up to 500g. By combining the visual system, there is no more need to place the objects in a certain way before the robot takes them. The robot goes to find them alone. Zuffa continues: "This enabled us to eliminate further conveyors and devices who would have to put the pieces in order, as well as a series of other elements that would have made the conveyor system more complex and cumbersome. Furthermore, the production format change can be easily managed. We just need to intervene on the software to move all types of products. Our solution is totally universal and provides a significant benefit with regards to the compactness of the final system." The entire machine measures around 3 m and hosts 2 robots positioned in such a way as to allow easy operator access and to facilitate the periodic cleaning activities. Compactness and lightness are two important features of the anthropomorphic FANUC LR Mate 200iD robot, built with an aluminum alloy structure, with an overall weight of 20 kg and able to carry loads of up to 7 kg with a reach of 700 mm. Zuffa explains: "The excellent loading capacity of the LR Mate 200iD robot allowed us to properly handle the simple blister inserting movement by acting on two pieces simultaneously, essential for achieving the required work cycle times of this project. In this case, the visual system does not track, but it controls the quality in the deposit area. Thanks to the experience acquired and to how easy it is to configure the iRVision software, it was not difficult to achieve the objective we had set." The experience acquired by Flexling in the field of robotic solutions combined to the quality of the products and assistance services of FANUC was a winning combination that contributed to the extreme success of the solution that was implemented; it has been working uninterruptedly on three working shifts for some time now and it was subsequently replicated by the end customer for the excellent performance achieved. Zuffa underlines: "The FANUC products have always ensured optimal performance and functionality, but the human factor makes an even bigger difference. The relationship with the technical service is excellent and based on a maximum cooperation and effectiveness." With this machine, in Flexlink, we have laid down the foundations needed to achieve loading solutions for blisters at an international level; very flexible and productive that can quickly adapt to the different specific needs of the customers who operate in various markets. Sambuy concludes: "It's an important element that fits into the global synergy of the Coesia group. The objective is to have every element that can be useful in providing a complete production line to the big multinational companies, from the initial processing of the basic product to its final loading onto a pallet. Numerous collaborations are already active within the companies of our group to allow us to exploit their respective skills, also involving the suppliers who can ensure that flexibility and responsiveness, which are needed to compete on the global market. 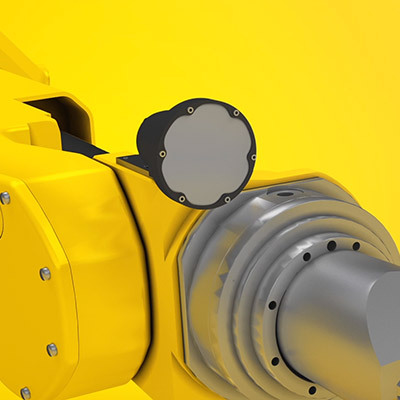 It's very easy to work with FANUC, it's a company that, in addition to supplying quality products, has demonstrated the ability to effectively respond to our needs and to be available also for our support needs. The common objective is customer satisfaction, because they expect reliable and consistent solutions for all the market needs."